*The patented Bernina Stitch Length Regulator measures x and y fabric movement with two sensors built into the needle plate. 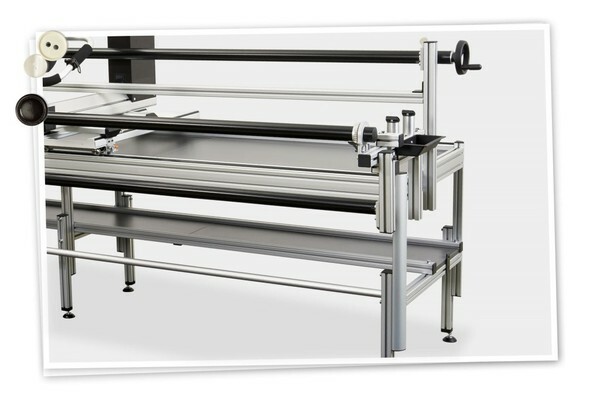 No need for service intensive encoder wheels, springs, plug in connectors, or wiring cables connected to machine platform carriages that have plagued other brands of longarm quilting machines for years!. Handmade in Switzerland. The BERNINA Q 20 is designed, engineered, and assembled in Switzerland and comes standard as a sit-down model machine. The generous longarm depth and height provide ample space for managing your larger quilts. Quilt larger quilts than on a domestic machine. The Q 20 offers less footprint in your sewing room. The BERNINA Q 20 comes standard as a sit-down model machine. The table is designed to elegantly handle the speed and weight of the Q 20 for optimal performance with style. Different desktop colors are available, see detailed product information. 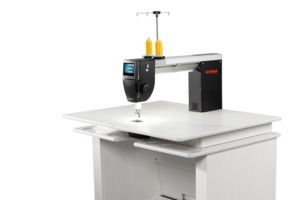 BERNINA Longarm Stitch Regulation: Master hand-guided quilting quickly with the assistance of the integrated BERNINA Longarm Stitch Regulator available on both sit-down and frame models. 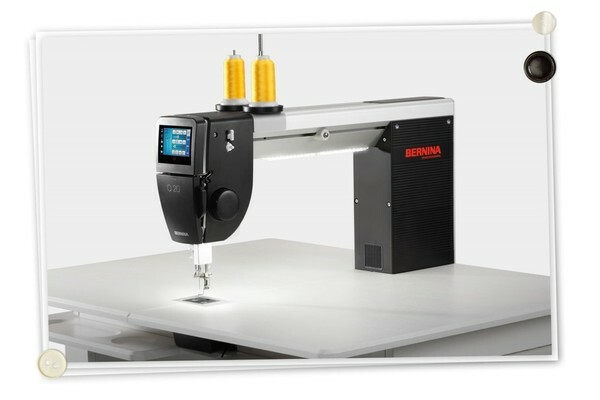 Equipped with dual optical sensors, one on each side of the stitch hole in the needle plate, the BERNINA Longarm Stitch Regulator allows for very precise sensing of machine and fabric movement. Simple to activate and customizable using the machine’s touch screen, the BERNINA Longarm Stitch Regulator keeps your stitches even and consistent regardless of how simple or complex your quilt motif may be. Choose between three BSR modes one of which is basting. 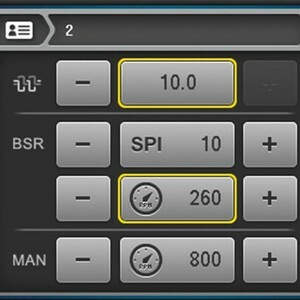 A manual mode with no stitch regulation is also available. 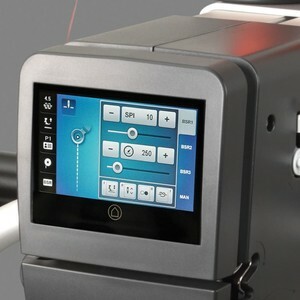 Unique user interface: BERNINA brings the best of the domestic machine world to the Longarm world with a simple to navigate color touch screen. Totally customizable, it includes useful functionalities with a stitch counter and built-in tutorial. Speed: With 2,200 stitches per minute for hand-guided quilting, you will complete more quilts quicker than ever. Built-in needle threader: Quick and easy threading of the needle thanks to the semi-automatic needle threader. 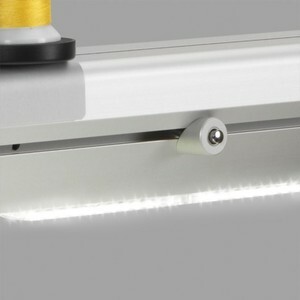 LED lighting: LED lighting along the length of the machine and above the needle illuminates the quilt for enhanced visibility. The brightness is dimmable or can even be turned off, an especially helpful option when working with white thread on white fabric. Unique model: The BERNINA Q 20 is designed, engineered, and assembled in Switzerland and comes standard as a sit-down model machine. The generous freearm depth and height provide ample space for managing your larger quilts. Undecided? The Q 20 can be upgraded to a frame model machine. 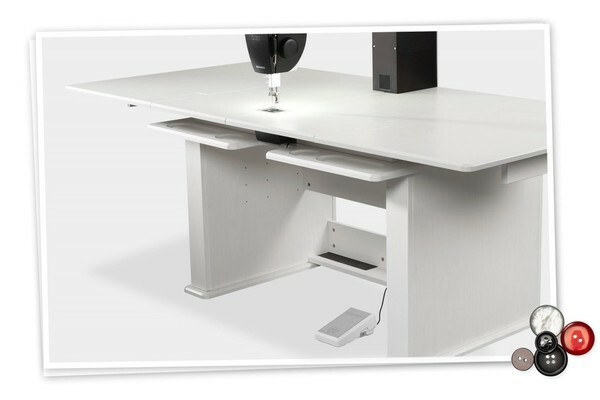 Table for BERNINA Q 20: form and function: The BERNINA Q 20 comes standard as a sit-down model machine. The table is designed to elegantly handle the speed and weight of the Q 20 for optimal performance with style. Table size basic: 0.91 × 1.15 m (approximately 36” × 45”) Table size expanded: 0.91 × 1.96 m (approximately 36” × 77”) Variable working height: 0.75 m (approximately 30”) Total weight incl. Q 20: 120 kg (265 lbs) Generous storage space Different desktop colors are available, see detailed product information. 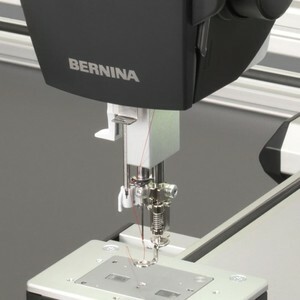 Optional upgrade to a frame model: It is possible to upgrade the BERNINA Q 20 to a frame model. 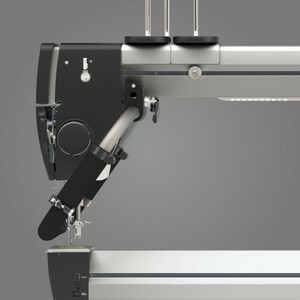 For quality machine performance the optional frame is robust enough to handle the size and speed of the BERNINA Longarm machines. Size (length × depth): 3.55 × 1.2 m (approximately 140” × 47”) Variable working height: 0.9 to 1.2 m (approximately 35” to 47”) Total weight: Approximately 150 to 180 kg (330 to 397 lbs) Optional: Hydraulic height adjustment.